On Helioscopium, Milwaukee-based F/i exhibits a variety of interests from heavy jamming 60's/early 70's spacerock, to intriguing experimental space/electronic collages. 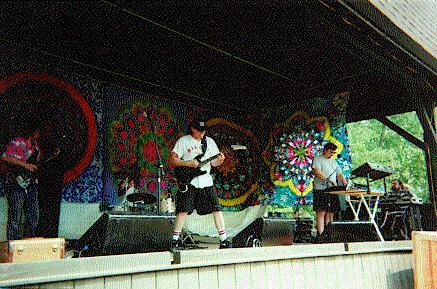 The band consists of Brian Wensing on guitar, keyboards, and vocals, Grant Richter on keyboards and electronics, Rick Hake on drums, percussion, and keyboards, Steve Schrank on bass, and various guests on guitars, keyboards, cello, and saxophone. The liner notes to the CD are filled with a full two pages of thanks-you's giving a glimpse into the band's many and varied influences. I won't list them, but I think its instructive to note that besides the expected Hawkwind, Pink Floyd, etc listings are such names as Hendrix, Zappa, Devo, Dolphy, The Residents, Black Sabbath, The Beatles, John Cage, Jon Lord, Cream, and - my own personal God and mentor - J.R. "Bob" Dobbs. I'm always interested in musician's tastes and influences even though they may not all be apparent in the music. F/i serves up a diversity of explorations. Their rendition of the "One Step Beyond" TV theme is an eerie, ooh-weeeee'-ooh track. "The 3rd Crown" is a heavy symphonic piece with a marching beat and heavy guitar strumming throughout. And "Your Illusion" sounds like a Beatles tune right off Magical Mystery Tour. We're talking "I Am The Walrus" here. One of my favorite tracks is "Doktors For Bob", an experimental sound and vocalization piece. Spacey synths, free jazz sax, tribal percussion, and scary vocals that reminded me of the voices on The Residents' Third Reich 'N Roll. This may sound like a crazed mixture, but to my ears it works well. 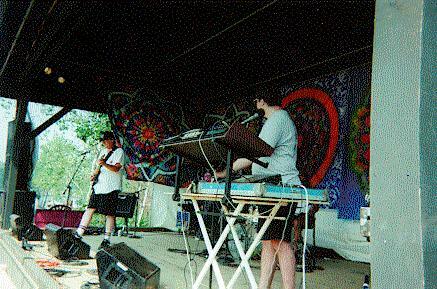 The remaining tracks explore more space and rock jamming territory. "Helioscopium" starts off with laid back swirling electronics and gliss guitar. Psychedelic, but not too heavy. Just trippy and enjoyably meandering. Then, while the synths continue to swirl, the guitar begins to crunch and the drums launch into a steady rock beat. Maintaining this beat the guitar goes into some pleasant cosmic soloing. "Starspot" is a similar astral type jam, though with a bit of a Middle Eastern feel. Two of the heaviest tracks are "Full Meddle Eddie" and "The Evan Walker Presidential Inauguration March" that run together as one 20 minute song. Eddie starts as a droning jam with some lusciously acidic guitar licks and the jam continues as the synths bob and weave throughout. The whole thing has a very 60's jam rock á la Cream/Hendrix feel to it, but the synths push the music into the cosmic space realm. F/i clearly have a variety of musical interests and these are reflected across the eight tracks on this CD. Band member Brian Wensing and I chatted on the phone one Saturday afternoon in February. AI: If I've got the count right, since 1983 F/i has released something like 19 cassettes, 9 albums, and 3 CD's? BW: Yeah, that would be a pretty close estimate. 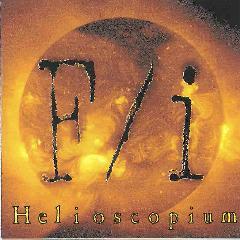 AI: Helioscopium was my introduction to the band. How has the music developed over the years? As as newcomer to F/i would I be surprised at some of the things I would hear on your earlier releases? BW: Definitely. The early stuff was pretty harsh, power-electronics, drum machines, no guitars, no vocals. Just industrial noise assaults. We would record anything that came across. Sounds of the guys beating on dumpsters, whatever, just throw it in the mix. That initially got our attention with RRR out in Massachusetts. Now that we're more semi-mainstream musical so to speak uhhh... the RRR guys are more into the noise. We've had to find another outlet for our music. AI: I've given Helioscopium numerous listens and I hear three general sides to the band: I hear a rockin' improvisational side, a more song-oriented side, and then - particularly on "Doktors For Bob" - a more avant experimental side. BW: Yeah, that was a pretty loose song. That was just a rehearsal and when we were going to mix down the CD it was just one of those things where, "Hey, listen to this track this is pretty wild lets throw that in there". It wasn't like a throw-off thing, but on the other hand we felt it fits with the mood we were in at the time. The pop songs, so to speak, we decided that at some point you've got to have airplay if you want to make it anywhere. AI: Is "Your Illusion" sort of what you had in mind for that? BW: That is actually an older song that F/i did way in the past and it used to be a pretty fast punk song. We just turned it down a bit and layered in all the ambience and it turned into a pretty cool jam. AI: The way it comes across to me it sounds like almost a Magical Mystery Tour Beatles kind of song. BW: (Laughs) Well its nice to be compared to some of my idols! That would be something to be able to continue on that, but still have our jams. Like "The Evan Walker Presidential March" and things like that. I was really proud of that one. Most of that stuff we went into the basement one day, rolled the tapes, and it came out. A lot of that stuff was one take. "Starspot", "Full Meddle Eddie", and "Evan Walker" were all done on that one day. AI: Do you see the songs, the jams, and the type of thing on "Doktors For Bob" as different F/i musical personalities? Are they conscious decisions to go into different areas, or do things just work out that way depending on how things go when you're playing on any given day? BW: Actually I think you hit it pretty much on the head. We wanted to give a nice representation. We can be sort of conventional, we can be sort of a whacked out, sound collage type of thing. And just loose jamming. Or we can come out and just really go for deep space. With the guys we have in the band now, some of them are classically trained and they're down there at rehearsals and scoring their parts. These guys have really got it down. AI: So you've got people from a lot of differnet backgrounds. BW: Exactly. Our cello player is actually a jazz musician. And Grant is building his own synthesizers now. His modules are just fantastic. He's taken the best of ARP and Moog and rolled it up into one. And right now I think if F/i hits the road I'd like to let the people know that these things exist. An F/i tour would be one of the best ways for him to do that. AI: Any touring plans at all? BW: We're going to have our big meeting tomorrow. We checked around the idea of getting out there in March or so when the kids are still on campuses. With everybody trying to get a week off it could be kind of tricky, but I'd like to pull it off. AI: Going back to the different musical personalities, influences, and backgrounds the musicians have, you've got two pages of very detailed and interesting thank-you's in these liner notes [Helioscopium's]. Not to repeat them all, but I just wrote down Hendrix, Zappa, Devo, Dolphy, The Residents, Black Sabbath, The Beatles, John Cage, Jon Lord, and Cream. Thats quite a mixture. BW: At a rehearsal I asked everybody to write down names whether it be from a movie or whatever. Something that had some kind of influence on your life. There were probably 40 or 50 more names we could have put on there. AI: Well I'm glad you did that because as a listener I'm always interested in what kind of influences musicians have whether its a direct or indirect influence on their music, or even a non-musician. Do you consider yourselves a spacerock band or do you like to stay away from labels? BW: Its kind of hard to not get away from that label in our case. We like to expand upon that and say we're spacerock with an attitude, or the dark side of spacerock, or spacecore or whatever. The label is kind of tricky cause here all these guys are a spacerock band and you'll get the CD and it could turn out to be very ambient, new agey stuff. AI: Like anything else its got a lot of sub-genres. BW: And on the other hand you say well F/i is space and pick it up and then say, "Jeez, I didn't want to buy a Black Sabbath record". So I think we are always more on the edgier, more punk side. F/i's roots go back into the 70's punk bands around here in town. And we all sort of got sick of that and picked up synthesizers and all of a sudden it was like, "Oh! You like Hawkwind too huh?" AI: Is there anything you can tell me about a local scene you have in Milwaukee? I noticed on your web page you have some newspaper writeups. Do you get to play out much locally? BW: Its kind of a tough scene. There's a guy at work who plays bass in a cover band doing a mix of classics and quote/unquote "new alternative" songs. And they're getting $400-$500 a night out in the suburbs playing for kids who want to hear the hits. Whereas a band like F/i plays out a couple times a year and we just play for the door and hopefully we get enough people there. And we try to make it an event with the lights, and the fog, and really make it something where a person can walk into the show and lose themselves for a while. BW: Europe is the place to be for this kind of music. AI: On your web page I saw a tour poster for Berlin. Have your toured in Europe before? BW: Yeah, we got over there right after the wall came down. That was quite an experience. Then we went back the next summer which is where the posters on that page are from. That was in '91. And we went back in '92 as well. AI: So you did get to play a number of shows over there. BW: Definitely. In '91 we were there for month. I think we did 17 shows. They were totally receptive over there. And we played over there with the UK Subs. All these radical punk bands and other experiemental things. It didn't matter. The people came to see a show. They didn't come to see a particular song or genre. They just came to be entertained. AI: So would you say you found a more positive reception over there from people who may not have even necessarily know the term spacerock? BW: Well actually no, because I think people are even more educated over there as far as... they would come up to me and say, "Oh, you guys sound just like Can", or "That one track sounded just like Faust". They're very educated into the whole prog and Krautrock scene. AI: What is your opinion of the general space/psych scene both in the U.S. and globally? BW: I think its generally overlooked. There are a lot of good bands. When we talked about the jazz influences, well obviously we spent some time with Doug Walker [of Alien Planetscapes]. He's another artist that can't get his just due. The guy's fabulous. He got like 100 releases and nobody really pays attention to him which is a darn shame. And I think a lot of the American bands feel the same way. It seems like the attention span... a 14 minute song just doesn't click. AI: So I guess it gets back to the old explanation that people just want to be spoon fed. BW: Basically yeah, its like everybody wants to be spammed or something, but everybody hates being spammed at the same time. We're not in this to make a living. The F/i thing is a hobby more or less. But when we do it we want to be the best we can be and put out a good quality package that hopefully will grab some ears. And judging by some of the response I've been getting so far it seems like the people are out there. Its trying to get them all in one place. For more information, you can visit F/i at their web site.